Thuja Occidentalis Smaragd or Emerald Thuja is a compact variety with a conical habit of growth giving great architectural value. Excellent for smaller conifer hedges. Thuja Smaragd hedging plants – Commonly known as the Emerald Thuja, Thuja occidentalis Smaragd is a slightly more compact variety and has narrow columnar growth making this not just a valuable architectural plant for borders and avenues bringing year-round structure to gardens – but also just the right kind of natural shape for smaller Thuja hedges. These Thuja hedging plants can be maintained easily at both modest heights of 120cm upwards – but also at modest width so your hedge doesn’t take up too much valuable garden space. 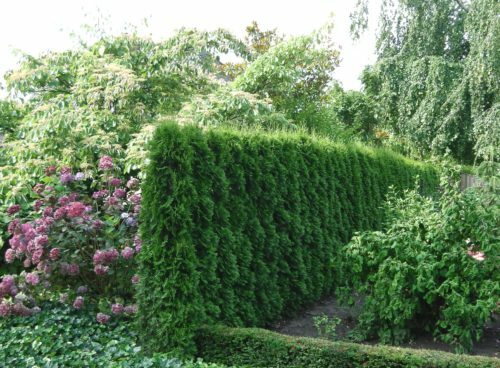 A single trim in autumn will keep a Thuja Smaragd hedge looking tidy. Thuja ‘Smaragd’ has beautiful emerald green foliage, paler green underneath keeping this colour nicely all year and has a pleasant aromatic scent when crushed. Like all Thuja the foliage is arranged in flattened sprays making this a distinctive hedging conifer. Grow Thuja Smaragd hedging plants in any soil that has drainage, these tough versatile plants are quite happy in chalk and clay soils and put up with windy and exposed planting sites in full sun or partial (or even moderate) shade. We have Thuja Smaragd hedging plants in a wide range of sizes from small starter plants through to big rootball plants and instant hedges of 2 metres or more. Pot grown plants are available all year and will grow away quickly as there is no root disturbance. Root ball Thuja Smaragd are supplied when naturally dormant from October until late April which is the correct time for planting. We also have instant Thuja Samargd hedges in sizes up to 200cm, perfect when you need immediate privacy right from the moment they are planted. Planting distance is a matter of personal choice, we have given our recommended density per metre but you can of course plant further apart if you don’t mind waiting a little longer for the hedge to knit together. We offer generous quantity discounts and delivery is free on most orders over £50 (ex VAT), if you are contemplating a lot of Thuja Smaragd hedging plants we offer generous quantity discounts. If you have any questions about our Smaragd Thuja or any other hedges in our range please do call our friendly sales team on 01580 765600.